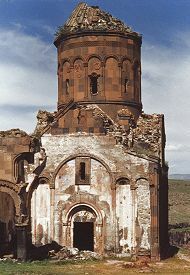 Other designations: Nakışlı Kilise; Şırlı Kilise; "Greek Church". 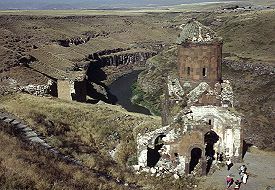 "In the year 664 (A.D. 1215), by the grace of God, when the lord of this city of Ani was the strong and powerful Zakaria ... 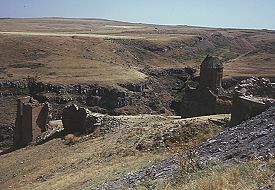 I, Tigran, servant of God, son of Sulem Smbatorents, of the Honents family, for the long life of my lords and of their children, built this monastery of St. Grigor, which was on the edge of an escarpment and in a place full of underbrush, and I bought it with my legitimate wealth from the owners and with great fatigue and expense, I provided it with defense all around; I built this church in the name of St. Grigor Lusavoritch and I embelished it with many decorations..."
At that time Ani was under Georgian control - and this church is believed to have been devoted to the Georgian Orthodox Rite (and the frescoes within are thought to have been painted by Georgian artisans). From the outside, the domed rectangular design resembles the cathedral - but on a smaller scale. 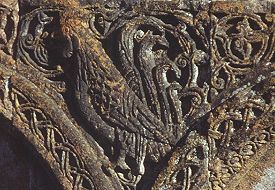 The interior plan is different and is similar to other churches from this later medieval period. It is of a type sometimes classed as a "domed hall" - a single nave partitioned into three sections with a dome over the central section. A blind arcade runs around all four sides of the church. 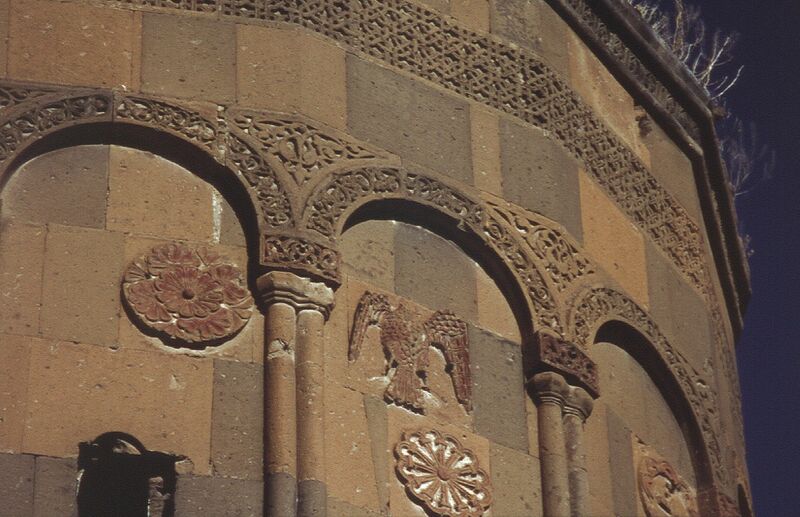 Ornate carvings (of animals - real and imaginary - set amid scrolling vegetation) fill the spandrels between the arcades. 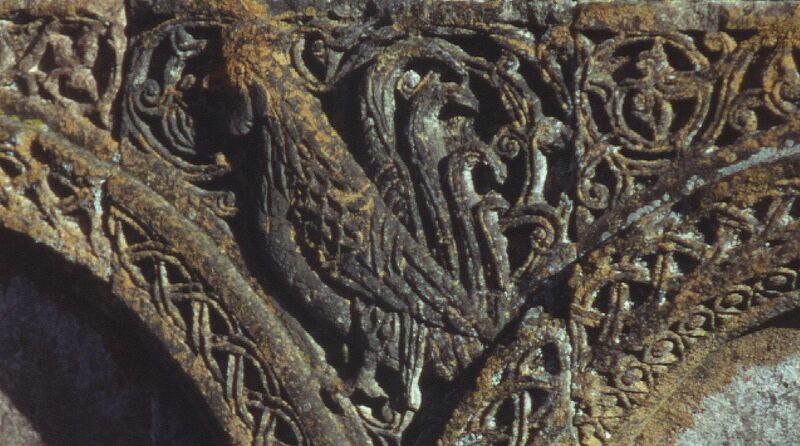 These form a decorative band that wraps around the whole building. 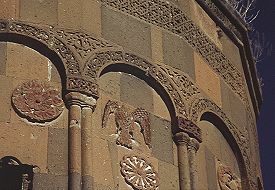 A similar arcade and decorative band runs around the drum - above which runs a second band of geometric fretwork (again typical of 13th century churches). 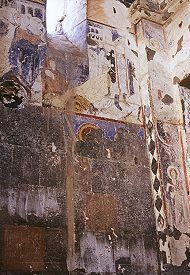 The interior of this narthex (including the facade of the church) was covered in frescoes - a publicly ostentatious display at odds with the stern austerity of Ani's earlier buildings, and not particularly appropriate given the city's precarious economic and political condition in the 13th century. Tigran Honentz was a member of one of several extremely wealthy merchant families that had amassed enormous riches (mostly through trade) and self-styled themselves "Barons". Although wealthy, they ultimately had little political and no military power to sustain their position - or Ani's. 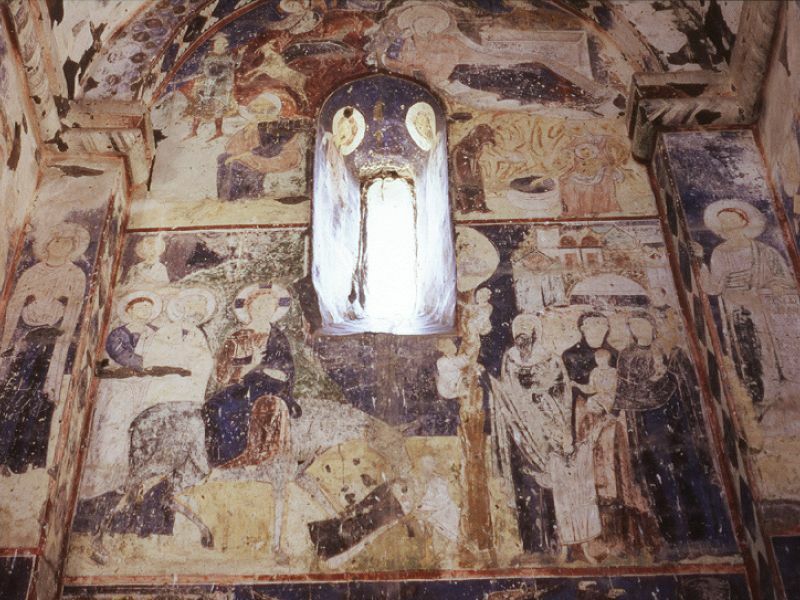 The interior is entirely covered with frescoes of the same date as the church. 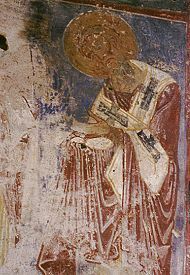 They have two main themes - the Life of Christ and the Life of Saint Gregory the Illuminator (to whom the church was dedicated). 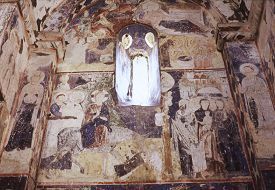 The eastern half of the church contains scenes from the life of Christ - including the Annunciation; the Nativity; the entrance to Jerusalem; the raising of Lazarus; etc. 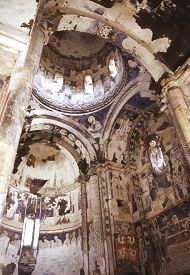 The western chamber of the church contains 16 scenes from the life of Saint Gregory the Illuminator - including his trial before king Trdat; the various tortures inflicted upon him (including his imprisonment in a pit); the martyrdom of St. Hripsime; the baptism of King Trdat and the kings of Georgia, Abkhazia, and Caucasian Albania; etc. 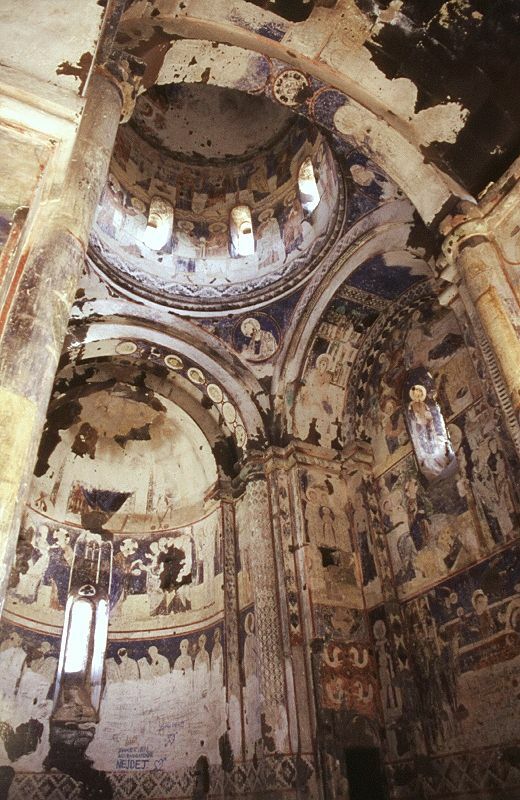 As mentioned earlier, the narthex also contained frescoes - these are mostly now destroyed or badly damaged due to weathering. 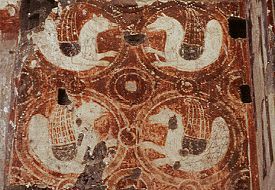 They are from a slightly later period than those in the church, and are different in style, having a finer and more Byzantine character to them. 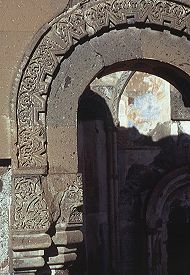 On the exterior wall of the church, above and to the right of the entrance, is a depiction of the Crucifixion. 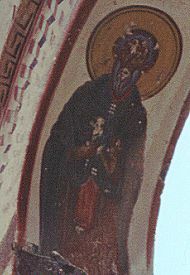 The Lamentation of Mary is depicted on the other side. However the most serious damage is of a bizarre sort. 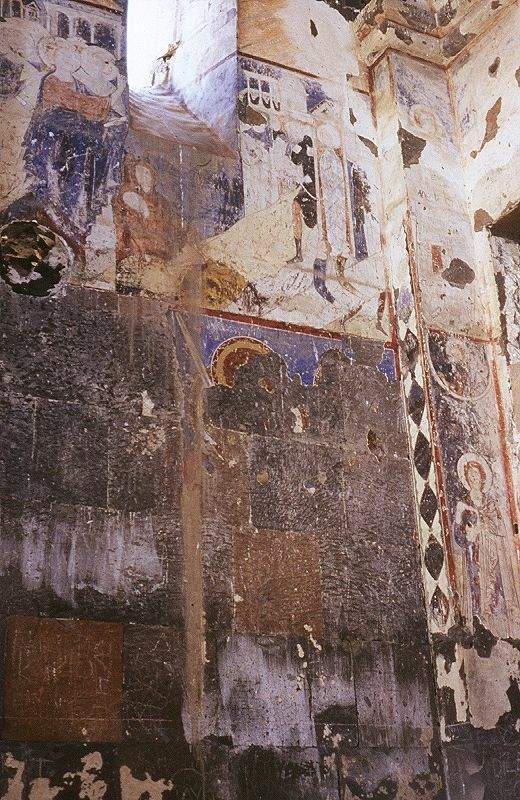 In an effort to hide the graffiti damage, large areas of the frescoes have been covered in whitewash! 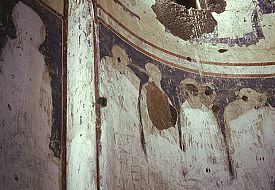 The frescoes on the northern wall of the church were particularly badly damaged by graffiti (including a large CND symbol hacked into the plaster). To "tidy" this section up the entire lower registry of paintings has simply been chipped off. 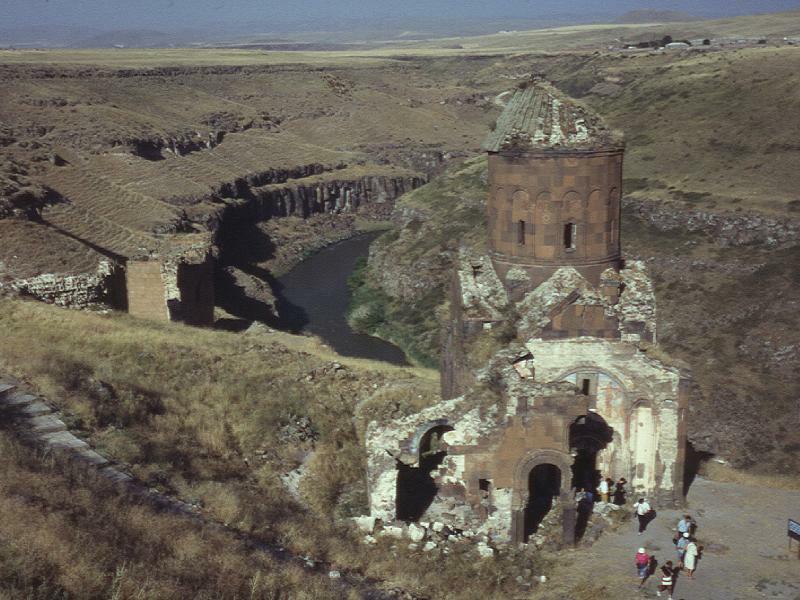 This damage occurred in the early 1990s - during the period of professor Beyhan Karamağaralı's excavations (see Ani - recent history) - and must have taken a considerable amount of time and effort to accomplish. It could not have been done without the use of scaffolding or ladders, and must have been officially sanctioned. 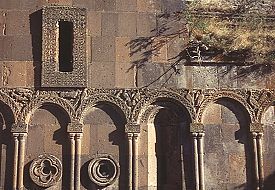 This page [Tigran Honents church at Ani] was first published in 1999. It was last modified on the 4th April 2000.